**My Desert Cottage**: More Christmas!! Christmas at my house is a pretty big deal. It's my hubby's favorite time of the year, so between our love of the holiday and my love of decorating we have not one, but two trees that I do every year. 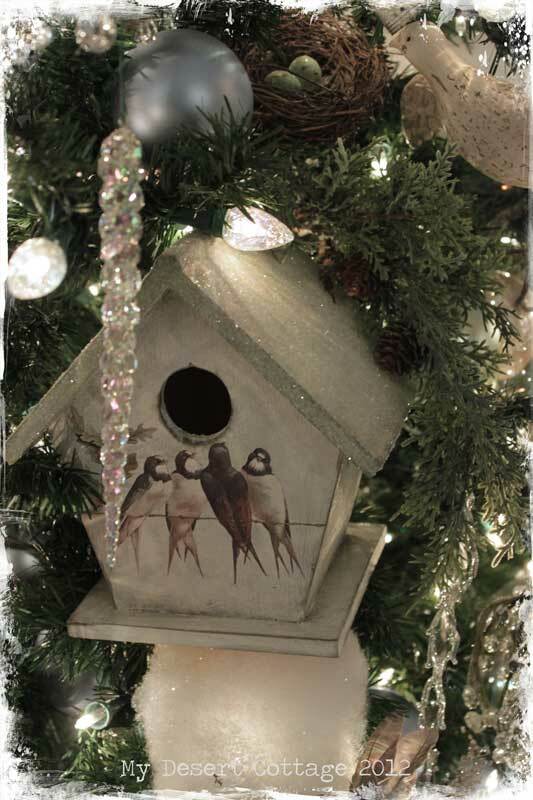 The tree in the Living Room has a bird theme. There are several birdhouses wired into the tree. I made each one just for this tree, and they get packed up every year. 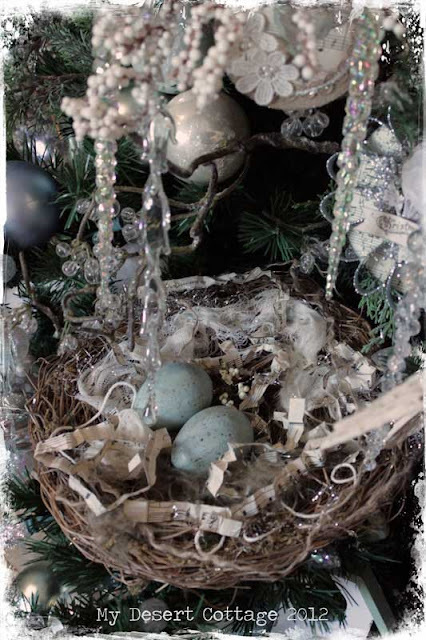 There are also several birds nests on the tree. 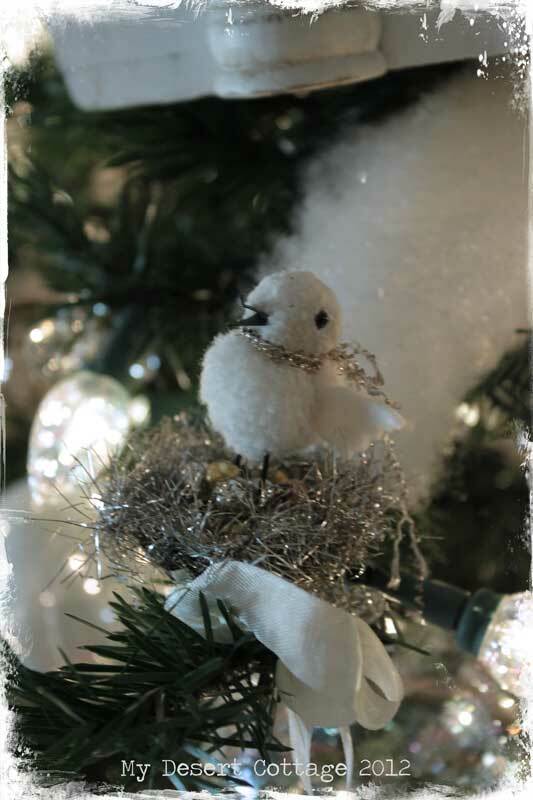 There is an old Christmas Legend that says that says anyone who finds a birds nest in the tree the bring home for Christmas will have good fortune and prosperity in the coming year. And I am in the process of making more of these little cuties too! There are doves on the table and a silver bowl full of pretty glass ornaments. This sits on my coffee table. My garlands are one of my favorite parts of the decor. 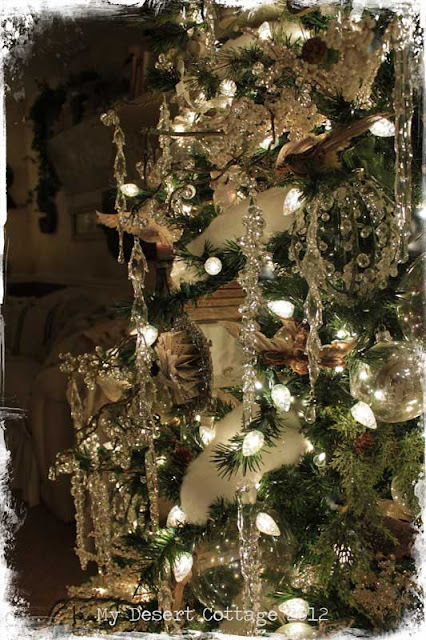 They are just dripping with crystal garland and glitter and glass snowflakes. During the day the glass snowflakes sparkle from the sun, and at night the lights from the garland twinkle behind them. It's so pretty. 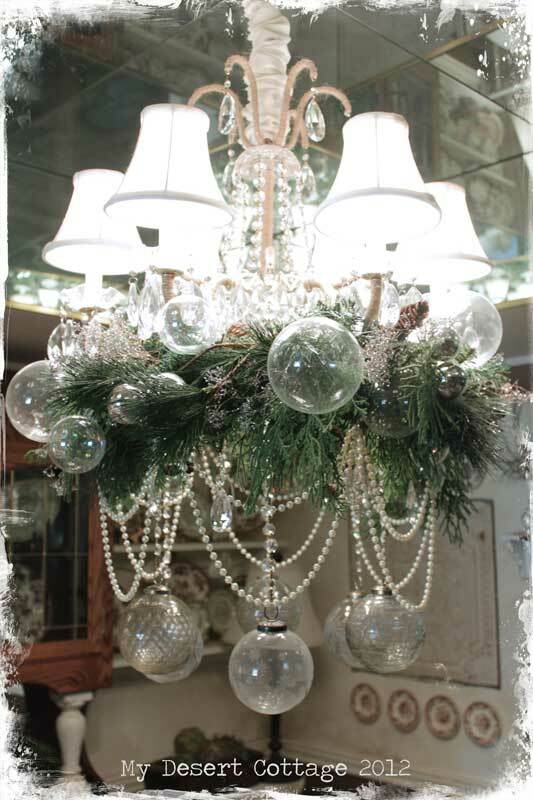 The Dining Room chandelier gets pretty makeover for the holiday too. The brown tranferware creamers that I usually have hanging there, gets replaced with cut glass Christmas balls. I tuck in Christmas greens where ever I can. Unfortunately, it's so dry here I have to use artificial ones, because the real ones dry out too fast!! You have such a gorgeous home! I love the way it looks all "Decked" out. I love your trees Karen, especially those little houses are so sweet. My kids decorated our tree this weekend and they hung several blue baubles in it (I should have let them disappear before they saw them :-))). I prefer neutral colors, like in your house. Well, I guess it's too late now. It is all so gorgeous!!! 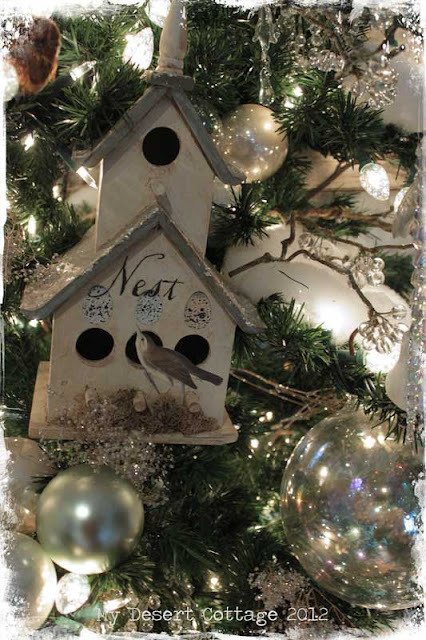 I love the bird themed tree so much! 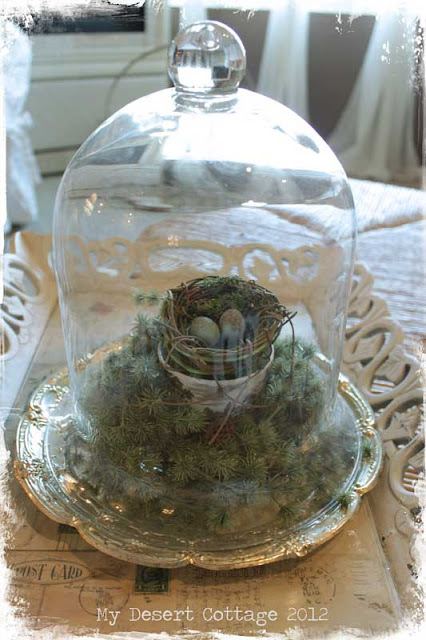 And the swags with greenery and just everything! It's all beautiful! I love the bird theme! It looks just wonderful. I love the garlands hanging on the windows and you get an amazing job dressing up your chandelier. 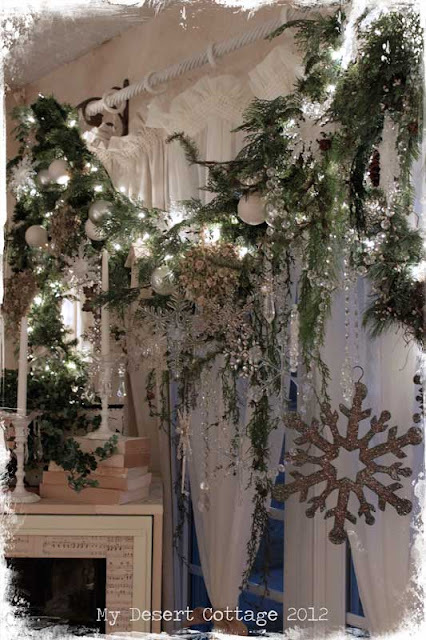 Thanks for sharing all your pretty decorating! Oh my ... WOW!!! Karen ... it is so amazing and beautiful!!! It's like living in Winter Wonderland in doors! LOVE IT!!!!!!! Hi Sweetie, Looks just wonderful. 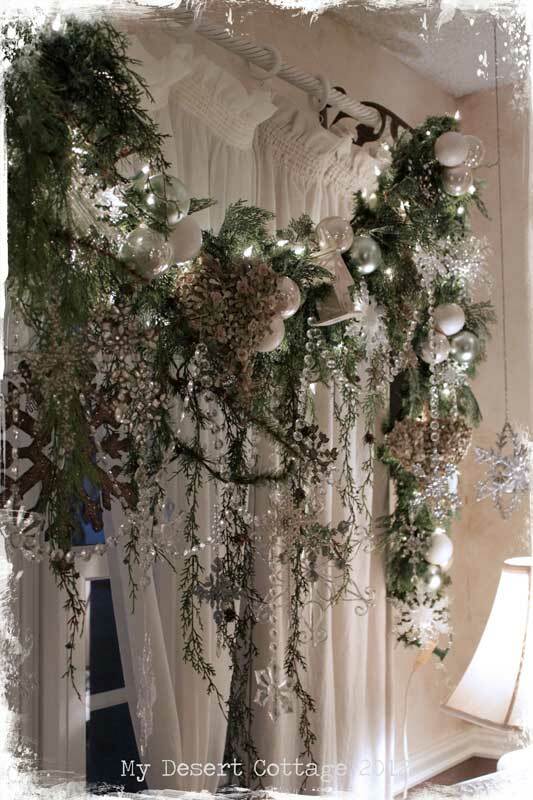 Next year I'm using your idea for window garlands. Stunning! I'll hit the after Christmas sales for all the goodies. Going to take another look before I leave. Must get my tree pics up too. Everything looks beautiful, Karen! I love your bird tree; those houses you made are all so pretty. The rosemary tree I bought for our kitchen counter is already 2/3 dried up. I don't understand it ~ I watered it. Back to faux for me! 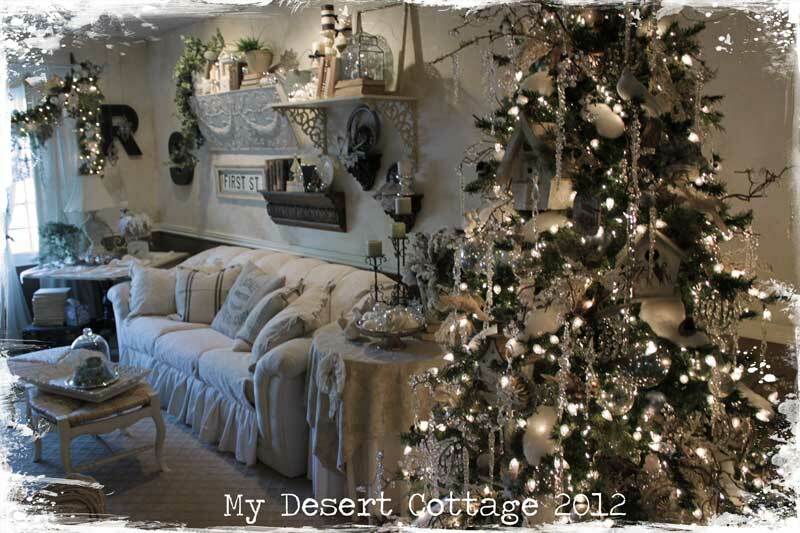 Karen you make an Arizona Christmas look amazingly Wintery and Cool... no easy feat when it's still 80 degrees outside! *winks* Everything is just Beautiful! Beautiful Christmas decorating Karen. I love the bird Christmas tree and that darling bird ornament. It looks to be made of yarn pom poms? Usually have a tree in each room but this year only 2 big trees and went very simple but I think pretty still. Hopefully it won't be such a pain when it comes to taking it all down! I am still trying to get my 500 Christmas ministry letters out- taking a little break to come visit as stuffing envelopes gets very boring! Nothing like waiting till the last minute to get your cards out! Simply dripping with charm! 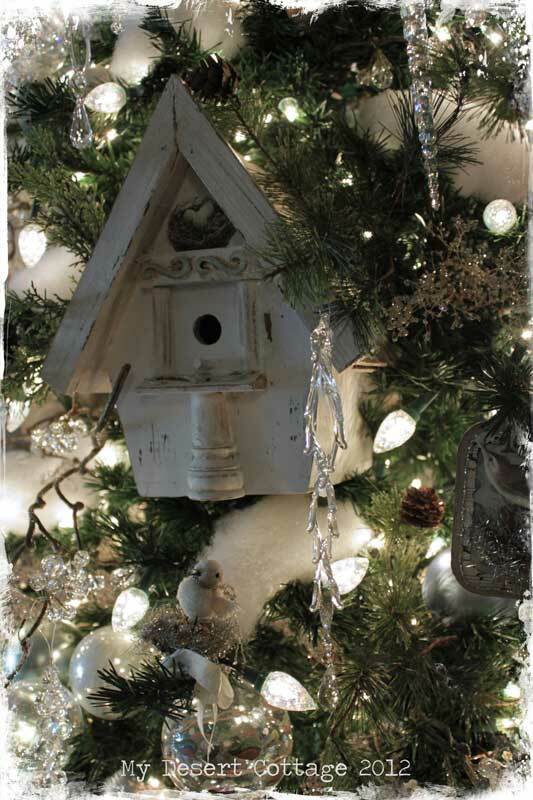 Love the gorgeous garland and cute handmade bird houses. Gorgeous! Soooooooooo pretty! I love your neutral color scheme! I did the Sugarplum/Candy, Santa theme thinking the GRANDS would be here but, now there's a change in plans & Nonna is not happy. Well, they enjoyed it all (& the Santa train) this weekend. Next time I put up the tree... it'll be a lot more like yours! Thanks for sharing! HUGS! Oh, my goodness, Karen, your decorations are GORGEOUS!!! I would love to see them in person and ohh and ahh over them. I cannot even imagine taking them all down. Spells lots and lots of work to me. 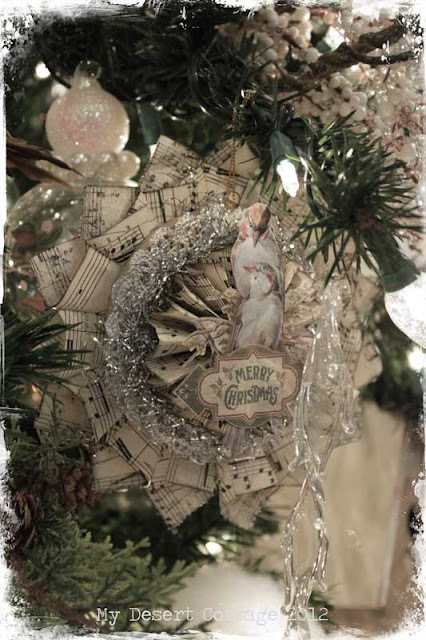 :o) Christmas blessings! Everything looks so magical, I love the bird theme. Hi Karen, your decor is very pretty. I am completely enthralled. I love the tree decorated with birds and related things, my kind of decor. The rest of the house looks lovely. Love your garlands that are just dripping beauty. Thanks for sharing your beautiful home. What a gorgeous Christmas post...truly inspirational. Beautiful Karen! You feed my creative soul! Love,love,love your decor! It is so sparkly & pretty! You always inspire me. Merry Christmas! Wow, your home looks like the backdrop for a fairytale story. W O N D E R F U L!!!!! 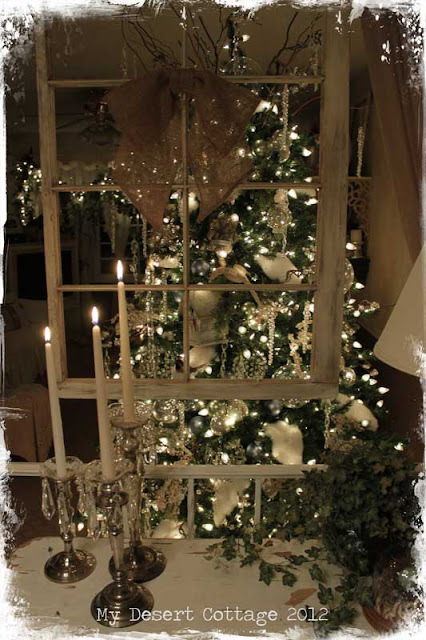 What a treat to view your Christmas home! All so lovely. OMG! Your trees and house are absolutely gorgeous Karen! I adore your bird themed tree and your garland is stunning! Wishing you and your family a very merry Christmas and a most joyous New Year. Absolutely beautiful! I too love your garlands! You know I always love "visiting" your home and seeing all the beauty you create. This was especially meaningful to me, as health problems have prevented me from decorating at all this year. 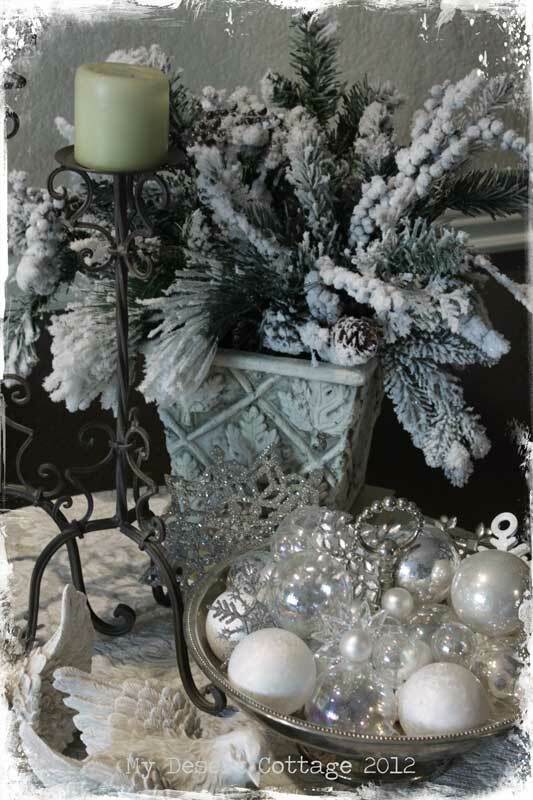 I was sitting here feeling sad, because I really love Christmas, and enjoy decorating the house, and this allowed me to escape into a tranquil and beautiful retreat! Thanks so much for sharing these photos, they mean more than you will ever know! Christmas just must be amazing at your home ... thanks so much for sharing your decorations with us ... i still remember your tree from last year's post ... always fabulous, always magical!!! Beautiful, just beautiful! I love the decorations!! Merry Christmas!! Wow ! How long does it take you to do this?! It looks dazzling! I bet you don't live with cats LOL! Mine would be in heaven-so many things to play with! I am so inspired! Thank you for sharing so many beautiful pictures and handmade items. I just want to get out the glitter and sparkle and make something! Oh Karen-- it's totally magical--- truly the most beautiful Christmas display I've ever seen. 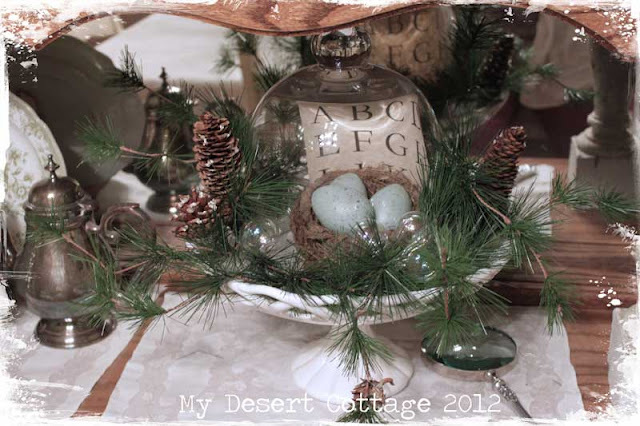 Do you participate in a holiday home tour where you live?? You need to open your doors to your community and share this amazing display. Thank you so much for sharing this with us-- honestly--- I wait all year to see these pictures!